In this article from LBO #128 (yes, it’s posted quickly to the web, but that doesn’t happen often, so you really should subscribe if you don’t), I talk about the lust that some people—within Wall Street, the Federal Reserve, and the world of punditry—have for getting the federal deficit down. Contrary to this I argued that this is really the wrong time to start thinking about that—we still need the short-term kick of deficit spending to help get the economy off the mat, and then over the longer term we need to rethink our economic model. But I do want to take a look at the evidence that deficit hawks use to scare people into the need for austerity: projections for the growth in federal debt over the next seven decades. Seven decades is a really long time to do forecasting over, since the economics profession isn’t really all that good at forecasting next year. But you do have to think about these things, if only to do some half-rational planning. People who worry about pools of red ink say that countries face the risk of debt crisis when their total debt reaches somewhere around 100% of their GDP. There’s nothing magical about this, but let’s just assume that this is more or less correct for a moment. On the Congressional Budget Office’s projection, which I characterized as hysterical without much elaboration in the original article, the U.S. won’t reach that point until 2074. Yet scaremongers are using that possibility as an argument for hacking away at Social Security and Medicare starting sometime in the next few years. But what about those projections? Why did I call them hysterical? Becase, for one reason, they assume that starting about 10 years from now, the U.S. will settle into a period of profound economic stagnation. To put a number on it, they project that from around 2020 through 2084, GDP growth will average 2% a year. To underscore the point, that’s over a period of 64 years—enough for a person born at the beginning of that period to reach very close to today’s retirement age by the end. How weak is 2% growth? It’s only a little over half the 3.7% average that prevailed from 1870 through 2009. There have only been a few brief periods in U.S. history when trend growth was this low—the 1930s and around about now, in fact. And that’s about it. For the full historical perspective, see the graphs below. 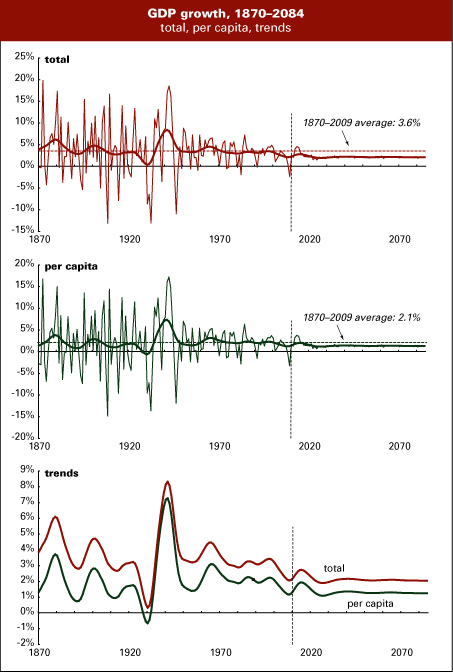 The top graph shows yearly GDP growth from 1870 through 2009 and the CBO’s projections for 2010–2084. The heavy line shows the underlying trend using a statistical technique called a Hodrick–Prescott (HP) filter. It’s sort of a high-tech average. Note that the projected 2020–2084 trendline is lower than just about every period in the long sweep of history. The next graph does the same, but with per capita figures. The results are very similar: the projected average of 1.2% (using population assumptions detailed in a moment), vs. a long-term historical average of 2.1%. And the trend is lower than almost every bygone period. And the bottom graph isolates the HP trends to emphasize just how at odds with the historical record the CBO’s projections are. How do they come up with these numbers? I asked the CBO for clarification, but they haven’t responded. But asking around yields something like this. Over the long term, economic growth is a function of labor force growth and the productivity of that labor—how much workers can produce in an hour or year of work. The CBO apparently assumes that the labor force will grow very slowly—around 0.3–0.4% a year. That’s less than half the current rate, and about half the rate that the Census Bureau projects the population will grow in the coming decades. If that’s true, the share of the adult population working will shrink to levels we haven’t seen since, well maybe forever, and certainly in modern times. At the same time, they’re assuming record-low growth in productivity, probably around 1.5%, which is something like a third below the long-term average, and well below the rate clocked in the much maligned 1970s. These assumptions are very similar to those underlying projections that the Social Security system will go broke. But if the economy grows at something closer to its long-term average, then that won’t happen. And the massive growth in debt won’t happen either, because the government will collect more in taxes than it would if we were locked in a semipermanent slump. So what’s going on here? Is the CBO pushing these strange projections to promote an austerity agenda—cutting social spending and privatizing Social Security? Or are they really serious that a seventy-year near-depression awaits us? Inquiring minds want to know. My theory is that the powers-that-be are anxious about all of that big government action we’ve been seeing the last couple of years. They don’t like seeing big government swaggering about the place, just as Greenspan didn’t like Bill Clinton’s budget surpluses. Sovereign governments have a problem with deficits if they are captive to private capital interests. Governments can ‘print’ money whenever they want and use that printed money to hire people who want to work. Public debt as we think of it is synonymous with the growth of private capital interests, whose ‘skim’ and political power would be usurped in such a situation. Excellent point. We need more analysis of the assumptions. And I think there’s no doubt the elite in our society are pushing an austerity agenda. Purple is correct per above in that the the government could, if it were controlled by a different class, print money to sustain the economy. I have a post on my blog about that – Deficits Don’t Matter. I doubt it is some plot on CBO’s part. More just a conservative bias in forecasting and a very conservative bias in multi-decade forecasting. But it is important to understand the assumptions behind this stuff. Like with social security where they use pretty grim economic forecasts to project the system going “broke”. Then people use that to argue for privatizing and that will be better because stocks historically return 8% per year (or whatever it is). So there is one economic forecast to project the system running out of money, but a different economic forecast for the preferred solution. 1. Why would the economy grow at something closer to it’s long-term average? 2. Why would the economy grow at all? 3. What term do you mean by “long-term”? 20, 50, 100 or 500 years? Meant as a poke: If I were to grow at my long-average, I would be 12 feet tall and weigh 360 pounds come 2040. That’s a reasonable question. However, it does have a pretty clear answer. However, it may not be the answer you are expecting. The EROP (Economic Report of the President) provides long-term economic statistics for the United States. Current versions are electronic. Older versions are available in PDF form. Using the EROP data (or the BEA / BLS / Census) you can construct productivity data series going back to 1960. With BEA data you can go back to 1929. Since 1970 per-capita GDP has grown at a rate of 1.8324%, well above the CBO estimate for long-term future growth. However, that was a consequence of large-scale female entry into the labor force. Obviously that’s not something that can happen twice. A better measure is per-worker GDP growth which averaged 1.3867% from 1970 to 2009. On this basis, the CBO is overestimating future economic growth. I can’t speak to the population estimates. However, the demand for public services tracks population with lags for retirement and the like. You know, I’m very familiar with economic statistics, most of them going back very far. I don’t need to be introduced to the ERP. The relevant stat is not productivity per worker, because the average workweek has shortened with the increasing prominence of service work (it’s about 5 hours lower than it was in 1964). It’s productivity per hour, which has averaged 2.1% over the very long term. If the labor force is projected to grow at an 0.4% annual rate, and GDP at a 2.0% rate, then the implied growth in productivity is 1.6%. It was 1.9% in the 1970s, that supposedly dismal decade. We’ve never seen a period in U.S. history where it was that low for more than a five- or ten-year stretch. And why is the labor force expected to grow at half the projected growth in population> The entry of women into paid labor has plateaued, so the LF shouldn’t grow faster than pop, but it should grow roughly in line. And people are postponing retirement, both voluntarily and not – another reason that the LF shouldn’t shrink as a percentage of the adult pop. So your arguments don’t hold up. Again, what was the (immediate) main target of Bush II after the 2004 (2nd stolen) election? Social Security. Since 1935, what has been at the top of ongoing goals for the conservative elite, as far as dismantling programs? Social Security. What was one of the main safety nets we Believed Obama would never allow to be Changed (gutted, step by step)? Social Security. As another domino falls because of his administration’s continuous sellouts, there are no doubts of betrayal remaining. The “collective good” they promote is a fascist focus as a guarantee for chosen corporations – and “sacrifice/self-reliance” (with bootstraps as the only guarantee) for the masses. And now, we are maybe two (“only a sliver”) PR cycles away from the next Change We Can Heave In. Well, perhaps the CBO is reflecting the aversion to tax hikes to pay for necessary infrastructure to promote broad growth and broad increases in income. After all, investing in roads, bridges, railroads are wasteful spending. Lincoln was a socialist and his signing of the pork barrel spending bill which was funded by high tariffs and income taxes was all wasted; the nation was better off when the crossing was by way of Cape Horn or through the Donner Pass. The road and bridge building to serve cars in the high tax 30s-70s was wasteful government pork barrel spending that just drove economic bubbles in the 80s, 90s, and 00s, all funded by crushing income taxes. The government pork barrel spending from the 40s-60s funded by high taxes on the military-industrial economy gave us computers, cell phones, and the internet, and all that led to were bubbles in the 80s, 90s, and 00s. We will be much better off with the conservative low tax plan that will prevent wasteful spending maintaining or improving the nation’s infrastructure, because the public sector needs to shrink to slow private sector growth. The Bush tax cuts have prevented job creation during the 21st century, ensuring low growth. And the pressure from the Bush tax cut deficits have prevented replacing the old bridges built by liberals with wasteful spending funded by income taxes, leading to the much improved infrastructure in Minneapolis. Unfortunately, liberals engaged in more wasteful pork barrel spending, earmarking money for a replacement I-35W bridge over the Mississippi. That wasteful bridge will promote growth in the region that is undesirable. Clearly the CBO is recognizing the conservative tax cut and decapitalizing of America – the lower the taxes, and more productive capital decays or is sold to Asia, the more growth will be slowed. The Bush tax cuts are working as intended to prevent job and income growth to the majority of America. And the CBO is reflecting the conservative policy setting success.